Green Bullard was a pioneer settler of Berrien county. He came to the area of present day Ray City, GA with his parents some time before 1850. They settled on 490 acres of land acquired by his father, Amos Bullard, in the 10th Land District, then in Lowndes county, GA (cut into Berrien County in 1856). Following the commencement of the Civil War Green Bullard, and his nephew, Alfred Anderson, went to Nashville, GA and signed up on March 4, 1862 with the Berrien Light Infantry, which was being formed at that time. 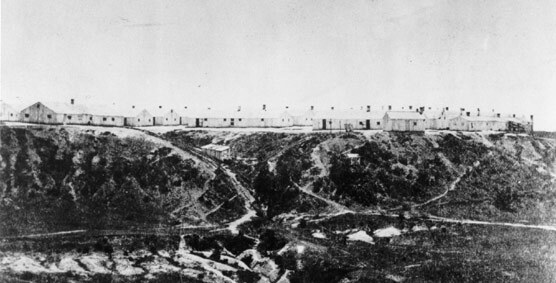 The company traveled to Camp Davis, a temporary training camp that had been established two miles north of present day Guyton, GA (then known as Whitesville, GA). There they received medical examinations and were mustered in as Company I, 50th Georgia Regiment on March 30, 1862. For many of the men in the 50th Regiment, this was the farthest they had ever been from home and the largest congregation of people they had ever seen. Coming from the relative isolation of their rural farms and small south Georgia communities, many received their first exposure to communicable diseases such as Dysentery, Chicken Pox, Mumps, Measles, or Typhoid fever. The first cases of Measles were reported within days of the men’s arrival and at times nearly two-thirds of the regiment were unfit for duty due to illness. On April 7, 1862 Bullard’s nephew, Alfred Anderson, reported sick with “Brain Fever” [probably either encephalitis or meningitis] while at Camp Davis, with no further records of his service. With so many down sick, the Regiment could barely drill or even put on guard duty. As the summer wore on, those that were fit participated in the barricading of the Savannah River and in coastal defenses. “In May 1862 the Confederate Government established a General Hospital in Guyton, GA,” near Camp Davis. “This hospital was located on a nine acre tract of land adjacent to the Central Railroad… From May 1862 to December 1864, this hospital provided medical care, food, clothing, and lodging for thousands of sick and wounded Confederate soldiers.” – Historical Marker, Guyton Confederate General Hospital. Finally, in mid-July the 50th Regiment moved out via train to Richmond, VA where they joined Drayton’s Brigade in the CSA Army of Northern Virginia. The Regiment bivouacked first at Camp Lee. 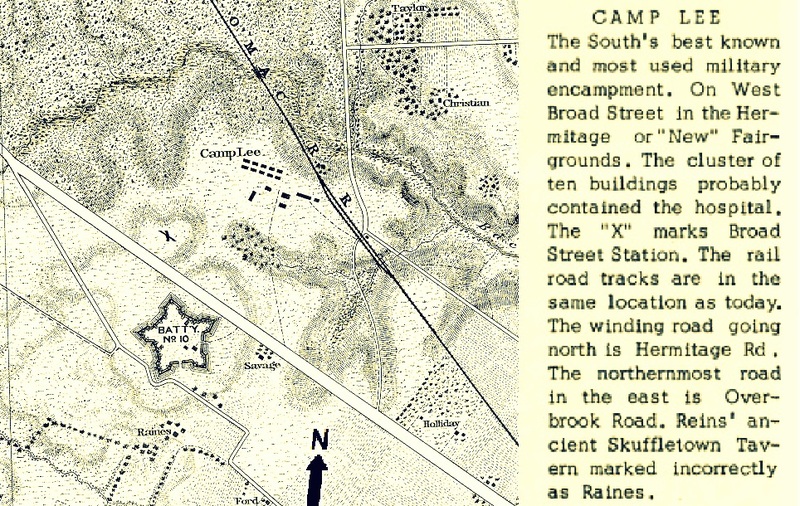 Camp Lee was a Confederate training camp that had been converted from the Hermitage Fair Grounds near Richmond, with the exhibit halls converted into barracks and hospitals. The grounds were filled with the tents of infantry and artillery companies. The men bathed in a shallow creek, “but it is doubtful if their ablutions in that stream are productive of cleanliness,” opined the Richmond Whig in August of 1862. Camp Lee, near Richmond, VA. Text from Confederate Military Hospitals in Richmond, by Robert W. Waitt, Jr., 1964. On August 20, 1863 the 50th Georgia Regiment moved out to see their first real action. but by that time company muster rolls show that Green Bullard was absent from the unit, with the note “Left at Lee’s Camp, Va. sick Aug 21st.” On September 7, 1862 Bullard was admitted to the Confederate hospital at Huguenot Springs, VA. Company mate Pvt William W. Fulford was also attached to the convalescent hospital at that time. The hospital muster roll of October 31, 1862 marks him “present: Bounty Paid”. He remained “absent, sick” from Company I at least through February, 1863. In 1862, the Huguenot Springs Hotel was converted to a Confederate hospital. On September 7, 1862 Private Green Bullard, Company I, 50th Georgia Infantry, was one of the patients convalescing at the hospital. On June 19, 1863 Bullard was admitted to Chimborazo Hospital Division No. 2, Richmond, VA this time with typhoid pneumonia. Typhoid fever was a major killer during the war. At that same time, James A. Fogle was a Steward at Chimborazo Division No. 3. Fogle was later promoted to Assistant Surgeon, and after the war came to Berrien County to open a medical practice at Alapaha, GA. Receiving and Wayside Hospital, Richmond, VA. was an old tobacco warehouse converted to a receiving hospital because of its nearness to Virginia Central Railroad depot. By January, 1865 Bullard was too weak to continue fighting. He was sent to Receiving and Wayside Hospital (General Hospital No. 9), Richmond, VA. From there he was transferred to Jackson Hospital, Richmond, VA where he was admitted with dysentery, which was perhaps the leading cause of death during the Civil War. Two months later, March 14, 1865 Bullard was furloughed from Jackson Hospital. No further service records were found. Following less than one month, on April 9, 1865, Lee surrendered to Ulysses S. Grant at Appomattox, VA ending the War. Despite the odds and repeated bouts of serious illness, Green Bullard survived the war and returned to home and farm in Berrien County, GA.
Isbin T. Giddens and Matthew O. Giddens were the two youngest sons of Isbin Giddens, a pioneer settler of the Ray City, GA area. The Giddens brothers served together in the Civil War. They joined Levi J. Knight’s company of Berrien Minute Men, Company G, 29th Georgia Infantry at Milltown (nka Lakeland), GA. Neither would survive the war. Mathew O. Giddens, a subject of previous posts (Matthew O. Giddens ~ Confederate POW), fought with the Berrien Minute Men for more than three years before he was taken prisoner on December 16, 1864 near Nashville, TN. He was imprisoned at Camp Chase, Ohio where he died three months later. Federal records of deaths of Confederate prisoners of war show that M. O. Giddens, 29th GA Infantry, died of pneumonia on February 7, 1865 at Camp Chase. He was buried in one of 2260 confederate graves at Camp Chase Cemetery. 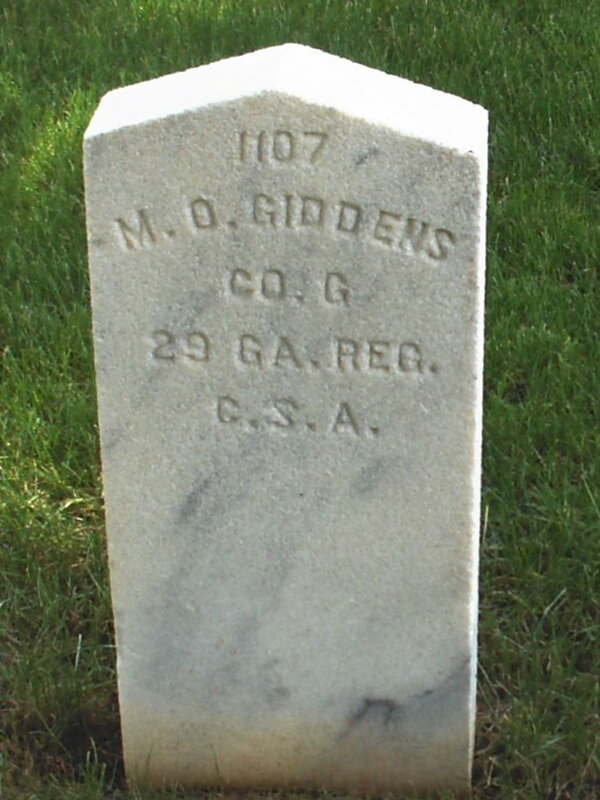 Isbin T. Giddens became a corporal in Company G, 29th Georgia Infantry Regiment, the Berrien Minute Men. He was enlisted at Savannah, GA on August 1, 1861. From August 1, 1861 to Feb, 1862 confederate military records show he was present with his unit. Whether in the P.O.W. camps or in regimental camps, Confederate soldiers like Mathew and Isbin Giddens were under constant risk for disease. In early December of 1861, soldiers of the Berrien Minute Men wrote home that there was an outbreak of measles in the camp of the 29th Regiment. In late December, the measles outbreak was even worse. By July of 1862 letters home from the Berrien Minute Men told of diseases spreading throughout the confederate camps: chills and fever, mumps, diarrhea and typhoid fever. Ezekiel Parrish made it to Guyton hospital at Whiteville. His Confederate service records show he was among the Berrien County men he was detached in May 1862 for carpentry work at the hospital. Another was Matthew A. Parrish, of Company I, 50th GA Regiment. But within three weeks time Ezekiel Parrish’s health took a turn for the worse. He was himself admitted to the hospital and died of measles pneumonia, June 5, 1862 at Whitesville, GA. Matthew A. Parrish would not long survive him; he died October 21, 1862 in Berrien County, GA. In May 1862 the Confederate Government established a General Hospital in Guyton, Georgia. This hospital was located on a nine acre tract of land between Central Railroad, a determining factor in locating hospitals, and current Georgia Highway 119, Lynn Bonds Avenue and Pine Street. The end of May saw five people on the medical staff at this hospital. Five months later the number had reached 46 people including surgeons, assistant surgeons, contract physicians, hospital stewards, ward masters, matrons, ward matrons, assistant matrons, nurses, cooks, and laundry workers. By May 1863, this hospital had a medical staff of 67 people. Confederate documents reveal that this hospital had 270 beds and 46 fireplaces. When the hospital was filled to capacity the Guyton Methodist Church was used to take in patients who could not be placed in the hospital. Surgeon William H. Whitehead was the Surgeon-in-Charge from May 1862 until February 1863, when Surgeon William S. Lawton took charge and served in this capacity until the hospital was abandoned in December 1864, when the 17th Army Corps of General Sherman`s Federal Army approached. From May 1862 to December 1864, this hospital provided medical care, food, clothing, and lodging for thousands of sick and wounded Confederate soldiers. The assignment to Guyton hospital perhaps gave Isbin Giddens a better than average chance of surviving his illness. 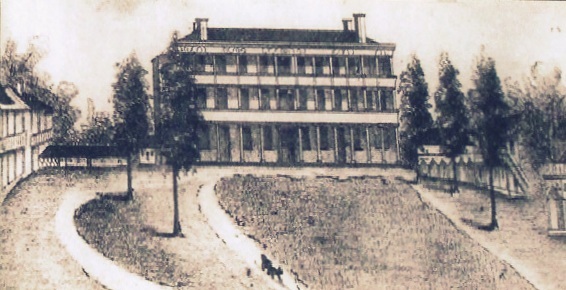 In Surgical Memoirs of the War of the Rebellion, Volume 2, issued 1871, Guyton Hospital was described as one of the most effective of the general hospitals in Confederate Georgia. Patients at Guyton were far more likely to survive gunshot wounds or disease than soldiers sent to other Georgia hospitals. The excess of mortality in the general hospitals of Savannah and Macon, Georgia, over that of Guyton, was clearly referable in great measure to the hygienic conditions and relative locations of the various hospitals…In the crowded hospitals, the simplest diseases assumed malignant characters; the typhoid poison altered the course of mumps and measles, and pneumonia, and was the cause of thousands of deaths; and the foul exhalations of the sick poisoned the wounds of healthy men, and induced erysipelas, pyaemia, and gangrene. Who can estimate the suffering inflicted, as in the celebrated case of the Augusta hospitals, by the development and spread of hospital gangrene in overcrowded hospitals situated in the heart of towns and cities? As a rule in military practice, the wounded should never be placed in wards with patients suffering from any one of the contagious or infectious diseases, as small-pox, measles, scarlet fever, typhus fever, typhoid fever, erysipelas, pyaemia, or hospital gangrene; and these various diseases should not be indiscriminately mingled together. The voice of the profession is unanimous as to the exclusion and isolation of small-pox, but we know from extended experience that sufficient care was not exercised in the isolation of other diseases. Despite the hospital’s better record with disease, Isbin T. Giddens died of “Brain Fever” on July 17, 1862 at Guyton Hospital. The term Brain fever, no longer in use, described a medical condition where a part of the brain becomes inflamed and causes symptoms that present as fever. In modern terminology, conditions that may have been described as brain fever include Encephalitis, an acute inflammation of the brain, commonly caused by a viral infection, or Meningitis, the inflammation of the membranes covering the brain and spinal cord. Giddens died with no money in his possession. His effects, “sundries”, where left in the charge of W.S. Lawton, Surgeon and later,Surgeon-in-Chief. His place of burial was not documented.